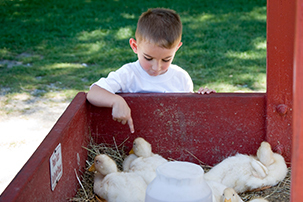 Flamig Farm offers a variety of activities for children ages 2 – 5. As described below, they give your young ones the opportunity to grow and learn in a safe and fun environment. Who knows? Maybe a start on the Farm will lead to a career for your child in veterinary medicine, agriculture research or sustainable food production for people all over the world! There is still availability in the preschool classes! Two and three year-olds attend with a caregiver for a morning of farm fun. Each session includes some craft and activity time, a circle with story and songs, a visit with one of our animals and a pony or hayride. 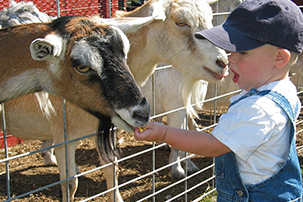 Admission to the petting zoo is included so you can enjoy the farm more before or after your session. • The cost is $100 for 4 weeks. • Dates are Fridays April 5, 12, 19 and 26 with Farmer Donna. • Dates are Mondays May 6, 13, 20 and 27 with Farmer Donna. • Dates are Fridays May 10, 17, 24 and 31 with Farmer Donna. • Children have a fabulous time exploring the farm more in depth as we focus on a different animal each week. Our time together will include a craft or activity, farm chore, visit with the animals, story and song time and lots of fun! Children may attend without a caregiver, but caregivers are welcome.